It's the 4th of July, Happy Independence Day, Slow Roasters! God Bless our Country and our troops! While you are enjoying family, friends, fireworks an other festivities; here is a delicious condiment that will dress up any barbecue! Wake up your everyday sandwiches and burgers with this delightfully creamy Homemade Pesto Mayonnaise. 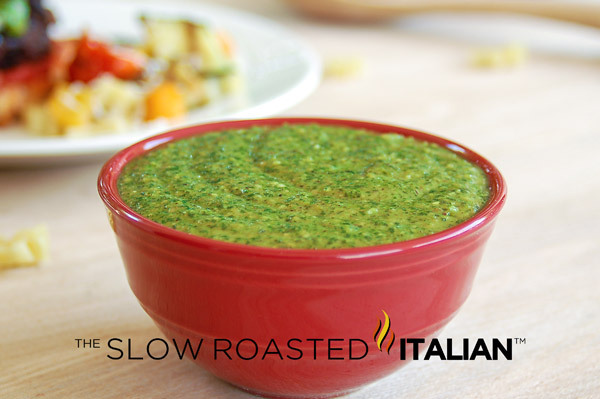 This is a rockin' condiment for your table that uses garden fresh basil and homemade olive oil mayonnaise to make this superb creation. Homemade Pesto Mayonnaise is great anywhere you would use mayo. This mayo has so many uses; on sandwiches, in summer salads, burgers, and more! This Homemade Pesto Mayo is the 'basil' layer in our mind-blowing Gourmet Caprese Burger with Balsamic Reduction. It truly lends an amazingly fresh flavor to the burger and really helps pull the caprese burger together! 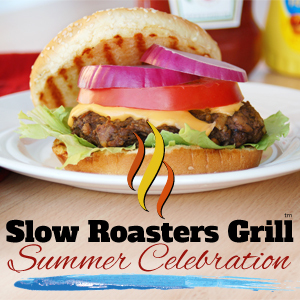 Check out an array of grilling possibilities at The Slow Roasters Grill! TSRI Tip of The Day: Use Homemade Pesto Mayonnaise in place of normal condiments on a simple turkey and fresh mozzarella cheese sandwich and you have a gourmet lunch. Cut it into 4ths and serve as fabulous gourmet finger sandwiches at your next party. TSRI Tip of The Day: Prepare chicken salad and use Homemade Pesto Mayonnaise in place of regular mayo and you have a luxurious pesto chicken salad! Don't forget to check out our spectacular giveaway! Fresina's Pasta Co & Italian Specialties is very generously giving away a custom Tour of Italia Gift Box (and will ship to the winners home) with an approximate retail value of $125. Earn BONUS entries today by PINNING and FACEBOOK SHARING this recipe! Check the giveaway for details. In a food processor, puree the egg yolk, lemon juice, mustard and salt. Once you have a very smooth mixture, very slowly drizzle the olive oil in while the food processor is still running. VERY SLOWLY! You will notice the mayo thickening as you add more oil. When you are done adding the oil the mayo will be thick and delicious! If it is not thick, add more oil 1/8 teaspoon at a time until desired thickness is reached. If your mayo is too thick for your taste, add water 1/8 teaspoon at a time until desired consistency is reached. In a medium bowl combine pesto and mayonnaise, stir until creamy. Pour into a resealable container. I use a pint mason jar. This recipe doubles perfectly! So much better than regular mayo, which I love! Happy Fourth. Oh this sounds so delicious - and so perfect as I am overgrown with basil in the garden - lovely! This would go great on a thin sliced flank steak sandwich. If flank steak weren't ridiculously overpriced right now. Maybe flat iron instead. Great post. This sounds awesome! I just made fresh pesto yesterday so this is perfect timing to try this recipe. I tried this recipe twice, once in my kitchen aid and once in my Ninja blender. It did not work and now I have wasted 1 cup of my good olive oil. The amounts seemed off so I should have used my judgement.